Iran's Defense Minister Ahmad Vahidi said today that American and Israeli "threats have no value and at the same time, show their aggressive nature, and reveal their deceitful and misleading claims," adding that any Israeli strike on Iran would be the regime's "last mistake." Iranian officials, including Vahidi himself, have made similar declarations in the past, insisting they are fully prepared to respond to any act of aggression against Iran while also reaffirming Iran's military posture as defensive and reactive. That Iran maintains a national security doctrine of self-defense and retaliation has been routinely confirmed by U.S. intelligence assessments. Vahidi's latest statement follows U.S. Secretary of State Chuck Hagel's recent visit to Israel, during which he cemented a massive arms deal - including missiles, radar, and aircraft - that he said should send a "very clear signal" to Iran. This past weekend, Hagel claimed that the United States and Israel see "exactly the same" threat from Iran and followed up such rhetoric the next day alongside his Israeli counterpart Moshe Ya'alon by declaring, "All military options and every option must remain on the table in dealing with Iran." In the context of alleging, as he often does, that Iran is somehow a "threat to Israel," Peres stated, "By the way, you know [we] have nothing against the Iranian people...Iran doesn't have a single enemy. Nobody threatened Iran. Why did their leaders decide to become a threat to others?" 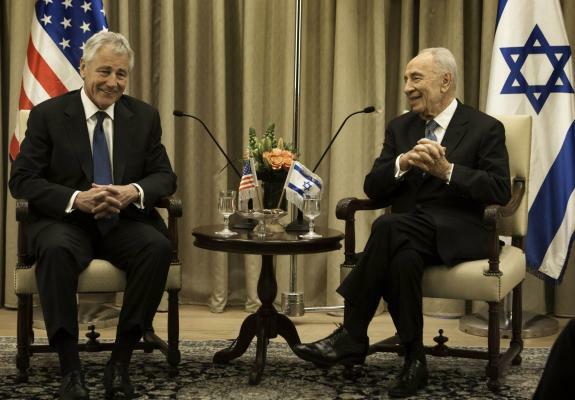 Apparently, Peres is unaware of the decades of military threats waged against Iran. Or, perhaps, he never happens to be paying attention when his own Prime Minister, senior military officials and others have repeatedly called for the United States to issue a "credible military threat" against Iran. He also must not know much about the covert operations, cyberwar, industrial sabotage, and murder campaigns leveled against Iran in recent years. Back in October 2010, Peres himself committed Israel to being an integral part of an "anti-Iran coalition in the Middle East," suggesting that the primary reason "to stop the secondary conflict between us and the Palestinians" is to allow the United States to focus more military attention and coercive energy on Iran. Peres' absurd formulation is nothing new. In early 1996, in an interview on French television, he scolded European nations for their economic ties to Tehran. "You must really stop flirting with the Iranians, "he said before striking a more aggressive and hysterical posture. "Iran is the center of terrorism, fundamentalism and subversion... [and] is in my view more dangerous than Nazism, because Hitler did not possess a nuclear bomb, whereas the Iranians are trying to perfect a nuclear option." In his recent comments with Chuck Hagel, Peres trod this same ground. "Israelis understand that Iran is not just a threat to Israel," he opined, "It's really a threat to the peace in the world, for no reason whatsoever. The world doesn't threaten Iran." But the countries that both Peres himself and his honored guest Chuck Hagel represent certainly do. A slightly different version of this piece was originally posted here.